Arthur Denison and his son are shipwrecked on an island but not an ordinary island, one where dinosaurs not only survived but flourished and built an entire civilization complete with cities, hatcheries, libraries and the like. The dinosaurs’ philosophy: "Breathe Deep. Seek Peace." "Dinotopia® is one of this season's crop of picture books with crossover potential . . . showing early signs of triumph in the marketplace." To dream is one thing. To create that dream with single-minded artistic determination is another. James Gurney is that rare artist for whom childhood fantasy became an adult reality, with all his experiences and accomplishments contributing to the knowledge needed to make the dream come true. The concept is simplicity itself: what if dinosaurs evolved into the intellectual equals of man and remained alive on a single, mythical island? Not a utopia, but a Dinotopia, with a science and lifestyle far more Earth-friendly than our own. To create this world, Gurney needed knowledge…a lot of knowledge. He graduated from the University of California at Berkeley with a degree in anthropology, then studied further at the Pasadena Art Center College of Design. Following years of free-spirited travel and commercial artwork with fellow artist Thomas Kinkaide, Gurney continued his creative quest with more than seventy paintings for book covers, but really reveled in his illustrations of ancient worlds for National Geographic magazine. Finally, he was ready to realize his dream, and Dinotopia was created through a series of prints, posters and a book. 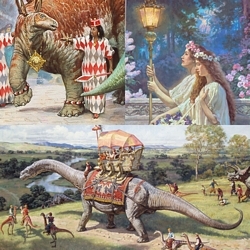 More works of art and books have followed (Dinotopia: The World Beneath and more recently Dinotopia: First Flight), in addition to many other tie-in products. A made-for-network television epic is also planned. Gurney has remained on the forefront of dinosaur research, making his creatures scrupulously accurate in addition to being wise and ecologically correct.